Old traditions can be innovative. 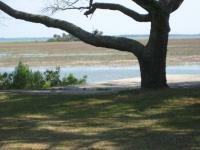 As I contemplate the meaning of inter-organizational collaboration, I am reminded of stories I have read and heard about St. Helena Island, South Carolina, the place where I now live. It’s the kind of place ignored by management gurus and corporate boardrooms; it’s also the kind of place they could learn a lot from. In the literature, organizational collaboration is described as occurring when people work together on a shared goal, through purposeful relationships in which they also share a commitment to each other’s success. This definition of collaboration is reminiscent of the historical cultural practices of the African American Gullah island community that is my adopted home. In action, it worked out that if I were a fisherman or shrimper and you were a farmer, we would exchange the fruits of our labors to make sure both of our families were fed a wide variety of nutritious foods throughout the year. If I were a dressmaker and you made horse-shoes, we would exchange services. If I had a boat and you did not but had pigs you needed to get to a Savannah market, I might provide you with transportation of your pigs to market in return for a pig for my family. People shared information, food, shelter during hurricanes and whatever else they needed to live well, and live well they did. This group of people understood themselves to belong to a system of activities that provided for the health and well-being of the whole. If a farmer was ill or injured during planting or harvesting season, a predetermined group of his neighbors would make sure his crop was taken care of. Before there were departments of social services, if a mother died and left small children, there was no question but that they would be raised by family, friends, neighbors or fellow church members. Oyster roasts, church functions, community sings, harvest and other celebrations maintained the relationship bonds through which a sense of community spirit was maintained. In these remote, rural communities, collaborations among and within local organizations exhibited the characteristics of today’s successful, corporate collaborative systems. Namely, there was purposeful communication for shared and energized consensus of purpose; there was ongoing effort to maintain communication within the system and, the group had a commitment to the success of all its members. So as it turns out, what seems new—collaboration—could actually be seen as old—sharing. And it is as important to productivity and growth now as it ever was. What seems to be lacking in much current corporate thinking is a systemic sense of interdependence that functions from a core belief in the possibility of win-win relationships and the importance of working toward them. Still, it is my guess that most of us have roots in collaborative cultures. We just have to allow ourselves to remember and be willing to believe that collaboration still works.